I have a couple of tweaks to my food habits, but enough about food. Let's talk about sleep. This goal was tricky to word, I generally write behavior- and not results-based goals; that's why I'm talking about habits, right? For example for food, I certainly wouldn't write a weight goal or even a body fat percentage goal or any sort of internal or external body measurement goal. I mean, none of these things are urgent for me. If they're urgent for you, it might be a cart of a different color; but the horse should still be in front of the cart for best results. And why am I like this, I mean not with the metaphors. Why am I pooh-pooh about results, is that not science. Yeah it's science, it's math, it's just not as simple math as some would have you believe, which I used to believe, 1 lb equals 3500 calories so do the math and so forth. Maybe watching Numb3rs did it to me, but honestly what is the likelihood that the amazingness of the human body can be expressed in an equation that was covered in high school algebra. I think that there probably is an equation that expresses it, but you have to be Charlie Eppes to write it out and the rest of us get our results out of a black box totally not or not totally under our control. What you can come up with more handily are behaviors, these here habits. Though truth be told, habits also sort of come out of a black box. Really who's in total control of their behaviors, but this is where I make my stand. I will say that sometimes habits work out, and sometimes they don't, and sometimes I know why, and sometimes I don't. But anyway Get Eight Hours of Good Sleep is a result far from wholly under my control, but it is the desideratum and I wanted it out there. I guess that's as much to say that I have a desideratum with regard to sleep, but not really with regard to food. Maybe because my food habits have gotten results. That's probably why, because that connection has been proven to my satisfaction. Whereas sleep is still witchery to me. Welp, you have to start somewhere! Where witchery leaves off and science picks up is with trial and error. If you haven't been trying because you want to avoid erring, you're doing it wrong! If anything, you want to run straight at error if only for elimination purposes. Error gives you something to correct from, error gives you something to work with. Well also, in summer the air conditioner has to be on, I can't sleep when it's hot. And maybe also straighten the sheets, I wake up if I get tangled in the sheets in the middle of the night. Not like brushing your teeth isn't a good thing to do, but that's about not getting cavities. I sleep fine with unbrushed teeth. And washing my face is about not getting pimples and putting on retinol cream is about not getting wrinkles, because I'm at that age where I'm worry about both, and prepping my tea is about having my tea to drink when I wake up. And doing bedtime yoga to brainwave symphonies is super nice but not necessary. I thought for a while that's what was working and was doing it religiously, and then I realized it was just the one key that unlocked the door and the rest of the keys were just for show, and promptly lost my religion like Stannis Baratheon. The cue is bedtime, which on play nights is after I've eaten my snack and chillaxed on the internet for a little bit, and on pastime nights is when my bones start to feel weird—does anybody know what I'm talking about, like they feel those rainsticks with the stuff trickling inside, ghghghghgh. Also there's some simple math around the actual time that I go to bed, I want to get at least eight hours of sleep and generally have to be out of bed by 8:00 AM. So it's not going to work out if I don't go to bed until two, right? 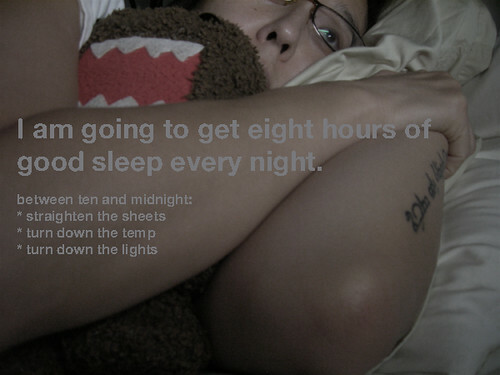 I'm in bed no later than midnight as a rule, and anywhere between ten and midnight as a preference. It minimally takes me thirty minutes to fall asleep, and sometimes my recovery requirements actually do call for sleeping solidly for nine and a half hours. So I'm supposed to do all of the above, except the bedtime yoga and brainwave symphonies I've given up on. Though maybe the brainwave symphonies would help me stay asleep, which is still a problem intermittently. How much of it gets done honestly depends on how much patience I have left, and often it's not a lot. In triage order, it goes: 1a) lights and temp down, and 1b) sheets straightened, those two always and almost always get done, 2) tea prepped, almost always, and then it falls off pretty badly to 3a) teeth brushed, 3b) and flossed, 4) face washed, and 5) wrinkle prevention. I guess for this habit we are really only talking about 1) which is decently established and 2-5) still need to be set up separately. I am sleeping more, and a lot better, than I was, like, around May and June. And perhaps I will have a few more things to say about sleeping more and better TK.